Warm, conversational, and exquisitely practical, Davies returns to the Jam Today series to share new recipes from her home kitchen--and stories about her experiences cooking for herself and her friends, family, and pets--during the best and worst of times. Whether she's describing how she set up her kitchen in an RV after a flood, encouraging young feminists to try cooking a baked potato, adapting an M.F.K. Fisher recipe to create "the world's simplest hollandaise sauce," or singing the praises of her favorite local food purveyors, her infectious enthusiasm provides inspiration for everyone from trained chefs to those barely able to scramble an egg. Featuring advice for omnivores and vegetarians alike about how to eat (and what to prepare) to survive natural disasters, cross-country moves, bereavement, holidays-gone-wrong, and even a spontaneous picnic, Jam Today Too provides all the ingredients for daily feeding of mind, body, and soul. 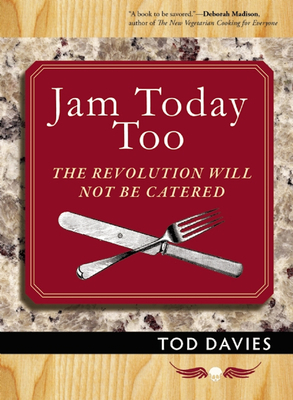 Tod Davies is the author of Snotty Saves the Day and Lily the Silent, both from The History of Arcadia series, and the cooking memoirs Jam Today: A Diary of Cooking With What You've Got and Jam Today Too: The Revolution Will Not Be Catered. Unsurprisingly, her attitude toward literature is the same as her attitude toward cooking--it's all about working with what you have to find new ways of looking and new ways of being, and in doing so, to rediscover the best of our humanity. Davies lives with her husband and their two dogs, in the alpine valley of Colestin, Oregon, and at the foot of the Rocky Mountains, in Boulder, Colorado.